With all the natural goodness of 100% milk, DYNAMOO is the perfect fuel for quick recovery at halftime, lunchtime or after a workout. It energizes and rebuilds muscles with 8 grams of protein and rehydrates with natural fluids and electrolytes. 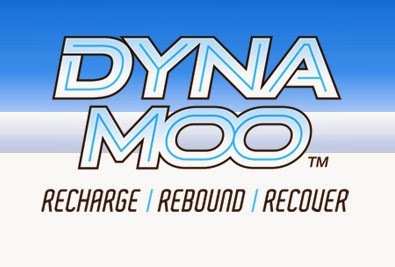 DYNAMOO is available in an 8 oz carton, 3-pack, and 18ct case in 1% lowfat chocolate, vanilla, and white milk. DYNAMOO® shelf stable milk is a product of Agropur Division Natrel USA. Agropur Division Natrel USA is a complete fluid dairy processor and dairy contract packaging company. The company’s state-of-the-art facilities produce a wide range of products including Natrel®, DYNAMOO®, and Parmalat brands of shelf stable milk, as well as Schroeder brand dairy and beverage products. Agropur Division Natrel USA produces products that are served in homes and foodservice locations around the US and Puerto Rico. Right now, you can only purchase DynaMoo in the Minneapolis Metro area at the following stores: Kowalski's, Festival Foods, CobornsDelivers.com, Dave's Sports Shops and a number of hockey arenas. In the Northeast Corridor, you can find DynaMoo at Stop & Shop, Giant and Demoulas. So, if you live in these areas (Minneapolis Metro Area or Northeast Corridor) and would like to win some coupons for FREE DynaMoo Milk then please feel free to enter this giveaway! It is very area-specific and I truly hope to get some entries in this giveaway! :) Here are your entry options. Disclaimer: I received no monetary compensation for this post. All quotes and stock photos are from the DynaMoo website and email. Prize is in coupon form and will be mailed by myself. This blog is not responsible for lost, damaged or stolen prizes and in this case, I am not responsible for replacing coupons under any circumstances. All thoughts and opinions are 100% mine. I have not tried it but I would love to! I have never tried Dynamoo before. no i haven't tried it yet.